Exciting changes happening to our home! We’re proud to announce our support of Tobacco Factory Theatres in their ambitious building redevelopment project, through sponsorship of a seat in their new Spielman Theatre. We have loved our office space in the Tobacco Factory over the last 17 years, from a single rented desk on the top floor, to a full loft studio space perfect for our multi-talented team. We’ve grown with the Tobacco Factory as it has evolved from a comparatively derelict building, to a centre for culture and creativity in South Bristol. We are proud to be based here. It’s great to see the changes inside the building that Tobacco Factory Theatre’s redevelopment project will bring, including a beautiful new theatre, new office spaces, developed front of house and dressing room spaces and more opportunities for young people in the area. To give something back we’ve joined Tobacco Factory Theatre’s Business Club. On top of the very cool Fanatic named seat, this entitles our team to 2-for-1 tickets to a range of shows across the year. 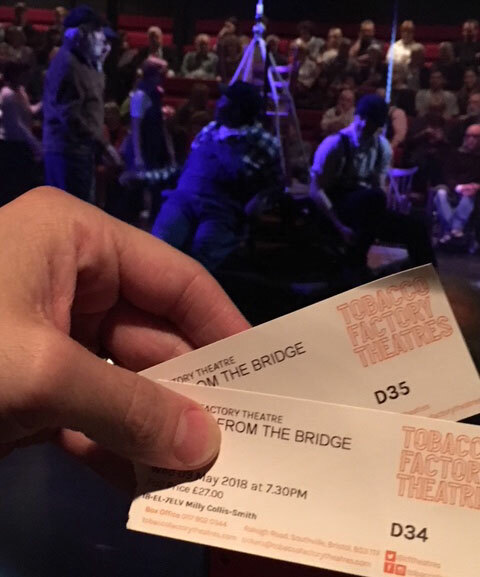 Team members Ian and Milly recently took advantage of this great offer to see a production of the fabulous A View From the Bridge. Having the opportunity to see such great plays right on our doorstep is one of the best things about being based in the Tobacco Factory. We can’t wait to watch more amazing new productions from our very own Fanatic seat when the Spielman Theatre opens this October.